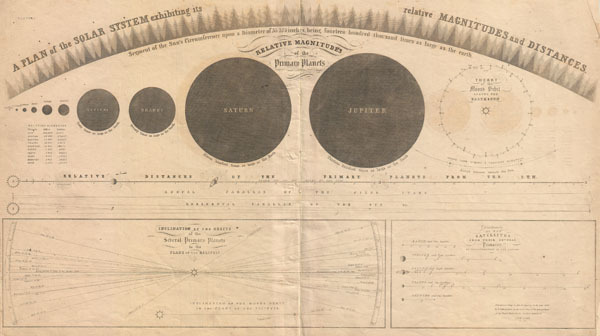 A Plan of the Solar System exhibiting its relative Magnitudes and Distances. This rare chart illustrating the Solar System was engraved W. G. Evans of New York for Burritt's Atlas to Illustrate the Geography of the Heavens. Shows the primary planets in relation to one another both with regard to magnitude and distance from the sun. Subcharts detail the inclination of the orbits of the other planets in relation to earth and the distances of various planetary moons from their primaries. Dated and copyrighted: 'Entered according to Act of Congress in the year 1855 by F. J. Huntington in the Clerks Office of the District Court of the United States in the Southern District of N. York. As a side note Elijah Burritt is the brother of the more famous Elihu Burritt, who was known for his philanthropic and social work. Burritt, E., Atlas Designed to Illustrate Burritt's Geography of the Heavens, 1856 edition. Very Good condition. Minor verso repairs and moderate overall toning. Minor margin extension upper right quadrant. Blank on verso. Rumsey, 2853.001 (1835 edition). Kanas, N., Star Maps, p. 277-78. Kidwell, Peggy Aldrich. 'Elijah Burritt and the 'Geography of the Heavens.'.' Sky & Telescope 69 (Jan 1985).